AmiUpdate, as the name might suggest, is an updating system designed purely for the latest incarnation of the Amiga Operating System known as "OS4", which is developed by Hyperion Entertainment CVBA based in Belgium. It has been around for a few years now, but only in the private world of AmigaOS 4 beta testing. 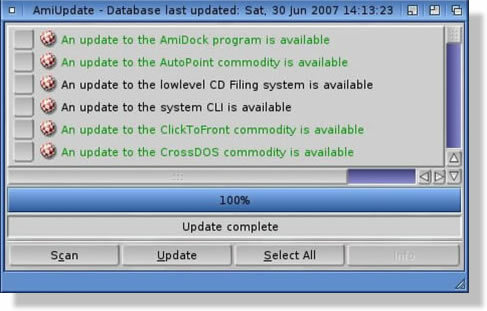 AmiUpdate has been used by most of the team for keeping their systems up to date with the latest files as they are released. Now it is your turn to make use of this software, and in turn make the housekeeping of your OS4 system much easier. System updates are reserved currently, for use only within the beta-testing environment, but you can still make use of the public portion of the database and the components and applications supported by it. A full list of the supported updates can be found in the Contents section. If you have any of the applications installed that are listed in that section, you should be able to use AmiUpdate to keep track of new versions, and automatically install them. Simply pressing "Scan" will start the process of checking for updates, you can then select any updates you wish to initiate (they are all selected by default) and click "Update" to actually download and install them. There is more specific information in the online documentation, reachable from the "Help" menu item. You can also view it from the Description section.